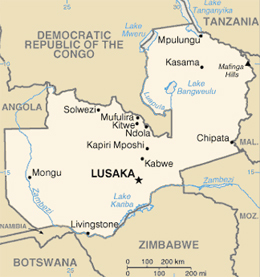 Zambia, in eastern Africa, obtained it independence in 1964, having been administered by South Africa as the territory of Northern Rhodesia since 1891 until 1923 when it was taken over by the U.K. It remains one of the least developed countries with a GDP of $800 per capita (2003 United Nations estimate). The Sisters of Mercy first arrived in Zambia in 1971 when Irish Sisters of Mercy Mary Cudden, Agnes Hannon and Veronica Moore became missionaries in the Monze Diocese. At first, they worked as volunteers with other religious congregations, and additional Sisters of Mercy from Ireland and Newfoundland were inspired to follow in years to come. Today, Zambia forms a Region affiliated with the Northern Province of the Congregation of Sisters of Mercy (Ireland), and there are six sisters from Ireland who minister in Zambia. They operate in three areas of southeastern Zambia: (1) Kaleya Community, Mazabuka; (2) Lyzyalo, Mazabuka; and (3) Buckley Estate, Lusaka. The Sisters of Mercy are involved in a diversity of ministries in Zambia. There is a significant focus on responding to HIV/AIDS and its impact on people of the country. In the area of education, the Mercy community is involved in teaching, training teachers, and coordinating food programmes for school children. One example is a Community School in Linda where the 1,000 enrolled students receive a good breakfast every day. Most of the children in this compound of 22,000 people are hungry, orphaned and vulnerable. This school was also able to build additional classrooms opened in 2005 through the generous support of family and friends located in Ireland of a sisters ministering in Zambia. In addition to these ministries, Sisters of Mercy are involved in home visitation, hospital visitation, and prison visitation; parish ministry; serving on the diocesan catechetical team; spiritual direction and retreat ministry; and coordinating a women’s centre.